I have two new projects hitting streaming platforms this week, Black Mirror on Netflix and Chance on Hulu. These two projects mark my first foray into streaming series. Before I dive into them, I want to step back and look at the seismic shifts in the television industry that made these series possible. By scoring the 2004 Battlestar Galactica reboot, I entered the television landscape right before it began to shift tectonically. Six years later, Battlestar ended its run at a time when fans still collected DVDs, and shared them with their friends. This feels like a lifetime ago, but I’m only talking about 2009! What I did not realize at that time, however, was that the medium itself was about to undergo a massive transformation. Almost overnight, mobile devices, streaming services, social media and binge-watching changed the way audiences consume media. Series can now exist without the need to justify massive ratings. ‘Cool’ has become currency. How many people actually watch your favorite streaming series? It matters less now. What matters is that people are talking about the show, driving subscriptions. Today, streaming services offer composers the chance to work on satisfying dramas, as compelling as anything on cable. In 2004, it was an old science fiction series that was rebooted. Today, the reboot has happened to the television industry itself. Having made my mark on the television industry right as this huge transition began, I have always been excited to dip my toes in the waters of streaming series, and this week marks the debut of two such projects. 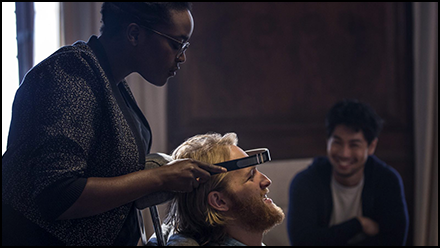 I am proud to have scored “Playtest,” the second episode of Charlie Brooker and Annabel Jones’ beloved Black Mirror, now in its new season on Netflix. This creepy, mind-bending episode tells the story of a world-beater named Cooper who signs up for a videogame test that makes him question his reality. The project reunited me with visionary director Dan Trachtenberg, with whom I collaborated recently on 10 Cloverfield Lane. Dan loves videogames as much as I do, so I was not at all shocked when he told me he wanted the score to reference retro videogame music, in particular 8-bit synthesis. To my pleasant surprise, the idea worked beautifully. My score for “Playtest” seethes with 8-bit arpeggiators, 1980’s style synthesis and other digital textures. As the story begins, we meet the main character, Cooper, setting out on an international adventure. 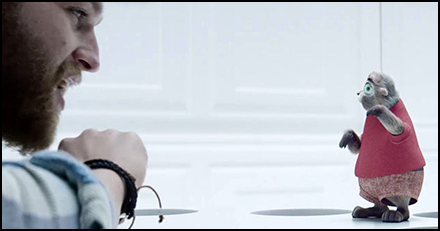 The first cue introduces a theme for him and his relationship with his mother that will become increasingly important as the narrative progresses. These early cues are built predominantly from videogame synthesizers and solo piano, with soft string passages adding subtle emotion. As Cooper undergoes the bizarre virtual-reality gaming experiment, the score begins to take on more traditional orchestral colors. Dissonant string textures gradually come to the forefront of the mix, obscuring the playful synth textures that represent Cooper’s confident character. These sounds, evocative of horror scores from the 1970’s, represent Cooper’s mounting terror, and serve as an effective counterpoint to the videogame synth sounds. I have always leapt at the chance to write in retro videogame styles, most notably on scores such as Dark Void Zero and Angry Video Game Nerd: The Movie. Scoring “Playtest” was my first attempt to integrate these sounds into a genuinely unnerving score, one that explores horror, drama and comedy, and I am thrilled with the end result. I am grateful to everyone involved, and Netflix, for giving me this remarkable opportunity to join the Black Mirror family. 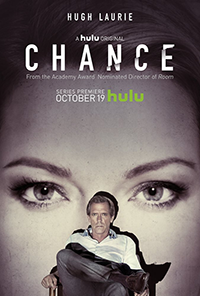 I am also proud to have composed the Main Title Theme for Chance, a new Hulu original series. Chance marks Hugh Laurie’s return to television, playing the title character in a psychological noir thriller, based on the novel by Kem Nunn. I loved the moody atmosphere of the book, and felt its contemporary San Francisco setting and pulpy detective story roots could combine into unique musical textures. Several episodes were directed by Oscar-nominee Lenny Abrahamson, who directed last year’s riveting Room. I was intrigued by the chance (lol, sorry for the pun) to be involved. I worked closely with Hugh, Lenny and the producers to find a unique sound for the title. I wanted to write music that captured the essence of both old school noir and contemporary storytelling. I felt this approach would allow the audience to soak into the seedy underworld of the series, while still retaining a cool modernity. The Main Title theme is a repeating melody, performed by an evocative solo cello. The haunting tune is accompanied by flirtatious upper register piano ostinatos, and then supported by a deep, heavy electronica groove. I was striving to capture a romantic, timeless quality (the piano and cello) and a modern sound (the electronics). Their marriage works effectively, I think, especially when set against the gorgeous trolley car and foggy San Francisco imagery of the title sequence. I reveled in the musical challenge of fitting many different conceptual layers into forty-five seconds. I am proud to be involved in this cool show, and look forward to seeing the rest of the story unfold in the coming episodes. With the debuts of Black Mirror and Chance, I am excited to expand my work into streaming series. And speaking of series, I hope you are prepared for the season seven premiere of The Walking Dead tonight! At this point, I can only say that the new season is crushing, beautiful and intriguing. I can’t wait for the world to see (and hear) what we’ve been working on.